Foreign National loans are designed for borrowers who live outside of the United States and would like to purchase a second or investment home. Three Credit Reference Letters from your country. CPA or Accountant letter reflecting annual gross income for 2 years, including year to date income. Additional documents such as signed loan application and disclosures, clear title, appraisal, etc. Note: All repairs/improvements must meet HUD’s minimum property requirements and meet or exceed local building codes. The repair prevents the borrower from occupying subject property for more than 15 days Major remodeling and structural repairs/alterations such as 1-4 structure conversion, additions, finished attics, basements, constructing a garage, changing footprint or requiring architectural plans, etc. In today’s market, most condos do not qualify for regular Conventional or Government financing. To find out if the condo you want to buy qualifies for FHA, visit the HUD website. Enter the State and County, and under Status select Approved. If you are looking to do a VA loan, go to the VA website and do the search. If the condo is not on the HUD site, it will not likely be approved for a Conventional loan without a limited review approval. Check the Fannie Mae Approved Project List website. To calculate your monthly mortgage payment and cash you will need, use our Loan Estimate tool. Enter the price, taxes and hoa fees, and select the Conventional loan type. 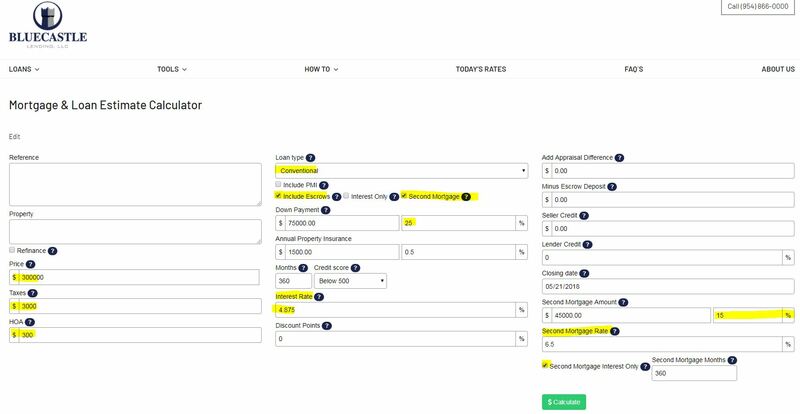 Select Include Escrows and Second Mortgage checkboxes. If you want 90% financing, for down payment enter 25%. Select your credit score, enter your interest rate and any discount points or lender credits. Under Second Mortgage Amount enter 15% and the interest rate for Second Mortgage Rate. Calculate. For more information please contact Bluecastle Lending at 954-866-0000 or info@bluecastlelending.com. Bluecastle Lending is an Equal Housing Lender. More often than not, self-employed individuals have a hard time obtaining financing due to their low Adjusted Gross Income on their personal 1040 Tax Return. One of the most common questions we receive get is “How much do I have to make in order to qualify to buy a house?” Our Income Tax tool will easily answer that question instantaneously. As long as you report the minimum Adjusted Gross Income that the tool suggests, and your debt stays the same, you will be able to qualify for a Fannie Mae, Freddie Mac or Ginnie Mae backed loan and get a normal interest rate. If you are unable to have that kind of Adjusted Gross Income on your tax return, then these Self Employed Mortgage Loans are designed for you. These loans that are not fit to be sold in the secondary market and do not follow Freddie Mac, Fannie Mae or Ginnie Mae guidelines. Usual loan denials due to unable to verify income for self-employed individuals are no longer an issue. Below are some of our programs. Subprime loans are those loans that are not fit to be sold in the secondary market and do not follow Freddie Mac, Fannie Mae or Ginnie Mae guidelines. Usual loan denials due to foreclosures, short sales, and bankruptcies seasonings are no longer an issue. Below are some of our programs.